according to the IUGS, as of July 2012. In the geologic timescale, the Middle Triassic is the second of three epochs of the Triassic period or the middle of three series in which the Triassic system is divided. It spans the time between 247.2 Ma and 237 Ma (million years ago). The Middle Triassic is divided into the Anisian and Ladinian ages or stages. Formerly the middle series in the Triassic was also known as Muschelkalk. This name is now only used for a specific unit of rock strata with approximately Middle Triassic age, found in western Europe. During this time there were no flowering plants, but instead there were ferns and mosses. Small dinosaurs began to appear like Nyasasaurus and the ichnogenus Iranosauripus. Source: (2015/01). 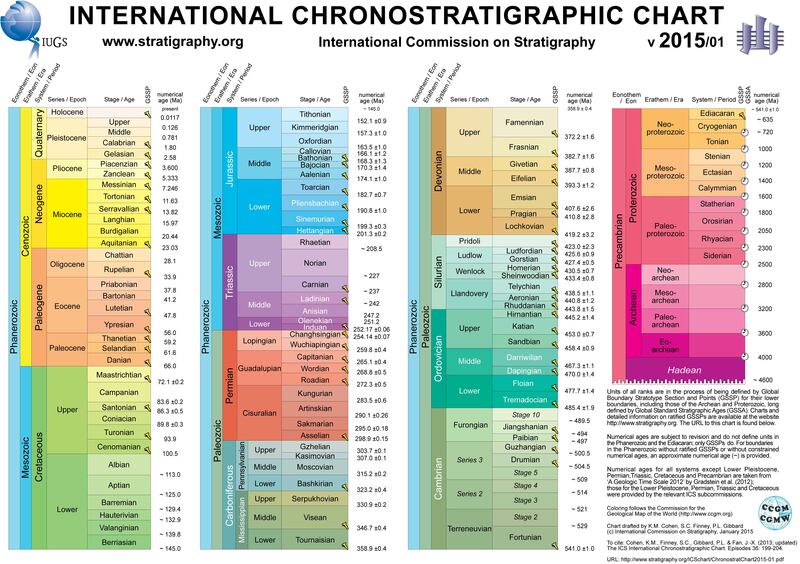 International Commission on Stratigraphy. Retrieved 13 July 2015. Divisions of Geologic Time—Major Chronostratigraphic and Geochronologic Units USGS Retrieved 10 March 2013.